Whether you are looking for a quick snack or a tasty fish supper then look no further. Our Award Winning Fish and Chip shops have been hand picked to be amongst the best in their field. Our current Good Food Award Winners for Fish & Chips are listed in our search section – Winners are announced on the 1st November each year. Find Good Fish & Chips near you. Formed in 2002 the Good Food Award was established to provide a unified Award system throughout the United Kingdom representing Good Food. Over the years a whole host of Awards have been made to niche categories with customers looking for differing awards for different food types. The Good Food Award covered a variety of food premises, for 13 years, from your local takeaway to fine dining and signifies the best in their class. 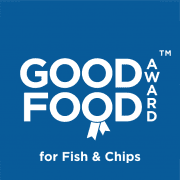 From 2016 we released the Good Food Award for Fish & Chips, a unique award programme specifically for the Fish and Chip industry. We use thousands of food reviews and compile their feedback each year to devise a score which we call our policy scorecard. Using statistical modelling we then form a type of league table by Category and the top scoring premises are invited to appear in our Awards programme. You can find further information about us or current winners on these links. We’re very social and would love to see you on facebook, click like and you’ll make us smile.